There is an important event coming up. One that will define the 2014 Penguins in ways that few other things can in the regular season. I’m talking about the Pens’ upcoming Home and Home series with the Flyers. In a season that has resembled a thrill ride at an amusement park, those two games may very well tell you if the Pens have what it takes to go deep this postseason. The Penguins/Flyers relationship is contentious and their rivalry firmly cemented in NHL history. NHL hockey returned to Philly after a 36 year absence in 1967, when the Flyers played their inaugural home game against the Pittsburgh Penguins in the new $12,000,000 Spectrum Arena. The Flyers won that contest 1-0 on a goal by Bill Sutherland. The Penguins would go on to suffer a 42 game winless streak at the Spectrum. From February 7, 1974 through February 2, 1989 the Penguins were 0–39–3 at the Spectrum. 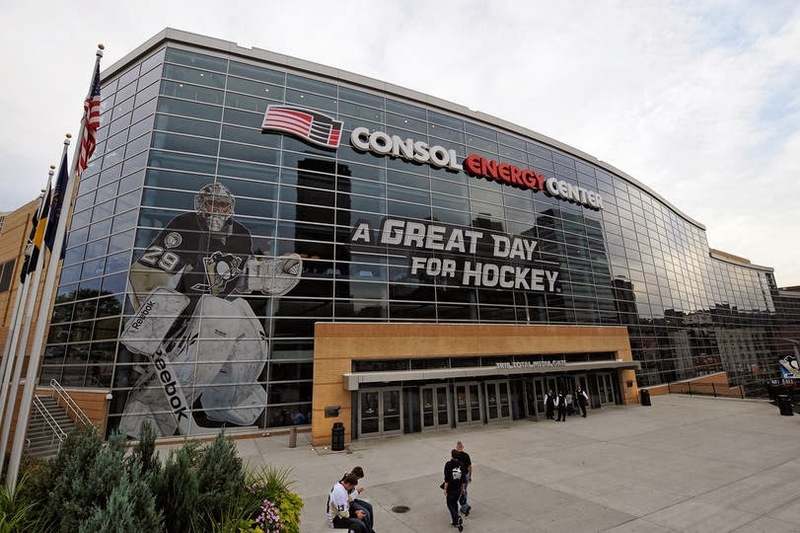 October 7, 2010 saw the Penguins open their new arena, The Consol Energy Center, against the Flyers. Rookie goalie Sergei Bobrovsky made 29 saves in his NHL debut to lead the Flyers to a 3-2 victory. The Flyers ruined the night for the packed house of 18,289 in the first regular-season game at the Pittsburgh Penguins' new $321 million state-of-the-art home. The most fiery irritation in the cross state feud may have occurred on July 1 2011. The Flyers signed Jaromir Jagr and once beloved third-line center Max Talbot in a move that would forever leave a bad taste in the mouths of the Penguin faithful. The two teams have met 263 times, with Philadelphia leading the matchup 145–93-30. They can’t seem to play a game that isn’t tension filled from the first puck drop to the final buzzer. In the spring of 2012 these teams met in a playoff series that set all sorts of scoring and PIM records. Perhaps most memorably, Philadelphia Flyers head coach Peter Laviolette melted down during a game between the two teams after Joe Vitale pasted Daniel Briere with a clean open-ice hit. 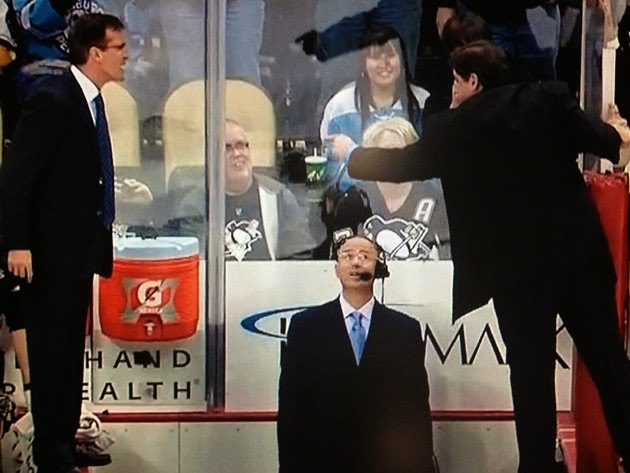 Lavi was furious and jumped up on the divider between the two benches, yelling at Coach Bylsma and the Penguins in general. This prompted asst. coach Tony Granato to jump up on the opposite divider and return Lavi’s tirade. In the end, it cost Laviolette $10,000 (and Pens assistant head coach Tony Granato $2,500). Assistant coach (now head coach) Craig Berube, interviewed after the game, called Malkin and Crosby the dirtiest players on the team. 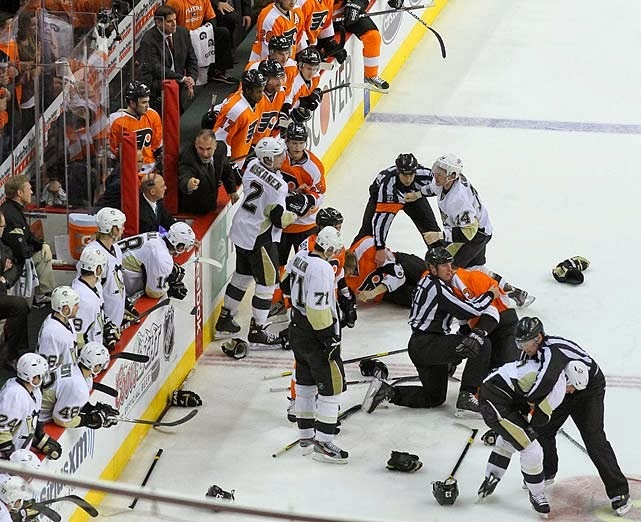 On February 21 of 2013, the Pens and Flyers met at the CEC in a bitter barn-burner that saw 11 goals, 18 penalties, three lead changes, two bears in the crowd taunting Ilya Bryzgalov, one fight, one actual hat trick and one of the Gordie Howe variety(from Wayne Simmonds). When the smoke cleared and the dust settled, the Flyers flew home with a 6 -5 victory. 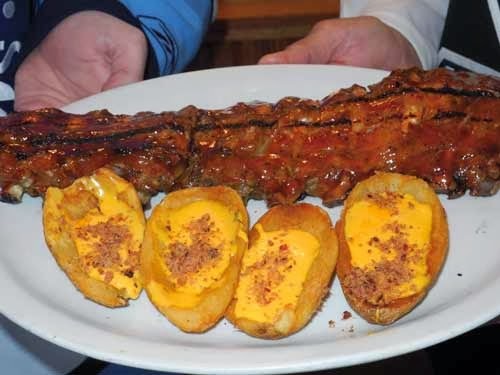 Laviolette credited his team's winning ways in the 'burgh to the savory barbequed ribs he would have delivered to their plane for the ride home - ribs he special orders from nearby DeeJay's in Weirton, WV. Laviolette, as the story goes, told reporters after his team's fifth-straight victory on Pittsburgh's home ice that DeeJay's ribs are the team's post-game meal-of-choice. According to CBSsports.com, Laviolette's went on to say, "Those ribs seem to be doing the trick. It went back to last year. Whenever the ribs are ordered, we win. I want to thank DeeJays." The owner of DeeJays put an end to the post-game rib ritual in April of last year. The Pens-Flyers relationship has been a bit different in the newly formed Metropolitan Division. Before the two teams could even play one game this season, the Flyers fired Laviolette and promoted Berube to head coach. They finished October with an unimpressive record of 3 wins, 8 losses. As we head into this week’s Home and Home, the teams have each won one contest in their two meetings. The Pens are holding on to the top position in the Metro but the Flyers have climbed to third place. Still, the two upcoming games will be fought with the fierceness of a Stanley Cup playoff. The Flyers, for their part, have been one of the best teams in the entire league over the past couple of months and are playing their best hockey right now, with the playoffs just weeks away. They had a huge home-and-home series with Washington and won each hard-fought battle. Philadelphia went 4-1 on a tough 10-game West Coast road trip, and also had a decisive victory over the New York Rangers after coming out flat against the San Jose Sharks in their first game since the Olympic break. What has contributed to this turnaround? Mainly, it’s been the re-emergence of Claude Giroux. He was pitiful at the start of the season (no goals for 16 games) but has been arguably one of the better players in the league over the past couple months. Since November 30, Giroux has been one of the highest scorers in the league with 47 points. The Pens, while still division leaders, have not been playing their best hockey of late. They aren’t getting many shots at the net (outshot by Anaheim 31 - 17). Their superstars have been held off the score sheet except for a few assists. They don’t look very confident with the puck. Granted, they are still dressing quite a few AHL guys, and Goc and Stempniak haven’t yet had time to acclimate, but you just don’t get a feeling that the Penguins believe in their ability to score either. They aren’t playing as a cohesive unit in their own end and lack a level of physicality and intensity that has commanded respect from teams in the past. What do the Penguins need to do to in order to take this home and home ? 1. Keep emotions in check. I’m talking to you, Geno and Nealer. The Flyers are a lot of things but stupid isn’t one of them. They plot and plan to get under your skin and get you to take stupid, emotional penalties. Every time you let them get under your skin you give them an emotional edge and weaken the whole team’s presence on the ice. Revenge, as they say, is a dish best served cold….like an ice cold puck in the back of their net. 2. Defense. It is no secret that the loss of Letang and Martin have left holes in the D you could drive a truck through. Now I’m looking to the veteran presence; Orpik and Scuderi. Each have hoisted the cup above their heads and knows what it takes to be a champion. 3. Sidney Crosby: Please score goals. NOTE: As I finished this article, the Pens played a much improved game to defeat the Capitals in Washington, 3-2.